The heart of a waterjet cutting system is the pump via which the water (or water plus an abrasive additive) is pushed through with extreme pressure. Depending on the type of system and its intended application, there are two styles of pumps that may be implemented for waterjet cutting systems. One is an intensifier pump and the other is a direct drive pump. The name of each gives an indication as to how they function to produce the needed pressure for the ultimate cut. Intensifier pumps essentially amplify (or “intensify”) the water or water plus additive to generate the pressure desired. For any cylinder with equal surface area on both sides, pressure applied to one side will result in the same pressure on the other side. If, however, the other side is smaller, the pressure will be greater, relative to how much smaller the second side is. Intensifier pumps have a differential of about twenty times between the large surface area where pressure is applied and the smaller side which is where the water pressure is created. Intensifier pumps allow for multiple machines operating together with heads cutting different parts. Unique sequences can be programmed for each head and machine. Intensifier pumps in these configurations need only to vary stroke rate in order to maintain a consistent pressure and water flow rate. Restriction generated by the orifice of the cutting head is what ultimately creates the water pressure. That pressure is then maintained until the diameter of the orifice becomes greater than the water output of the pump. Direct drive pumps function much like the engine in a vehicle. A crankshaft is turned via a motor that is attached to multiple offset pistons. The pistons begin to turn along with the crankshaft within the cylinders in which they are houses. This creates pressure in the water. The speed at which the crankshaft turns determines the ultimate rate of flow of the water. Waterjet systems with direct drive pumps can move water much faster than those with intensifiers, typically around 1500 revolutions per minute and are typically found in applications with pressures less than 55,000 pounds per square inch. Direct drive pumps are only able to run multiple cutting heads together if all of the cutting heads are cutting the exact same part at the exact same time. Additionally, direct drive pumps have greater maintenance requirements than intensifier pumps as there are more internal parts involved and therefore greater need for maintenance. 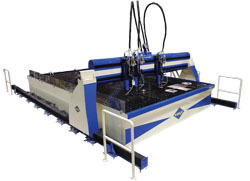 WARDJet Inc. provides waterjet cutting systems featuring what some consider to be the most advanced, innovative and intuitive motion control systems in the industry.